The Nashville Predators are assembling a strong core of young talent. Leading the way on offense is Swedish phenom Filip Forsberg. Showing a knack for scoring and setting up goals, it might be a little early to peg him for the NHL's elite but he's on his way. For those looking for Filip Forsberg rookie cards, they have plenty of choices. Shop for Filip Forsberg cards on eBay. 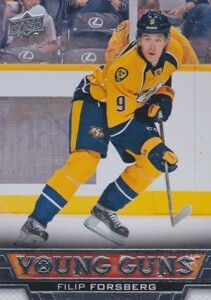 After being drafted by the Washington Capitals with the 11th pick in the 2012 NHL Draft, Forsberg was traded to the Predators late in the 2012-13 season. He made his NHL debut with Nashville not long after. Forsberg played five games in 2012-13 and 13 more in 2013-14. So while he's no stranger to NHL ice, 2014-15 is his official rookie season. Filip Forsberg rookie cards are in 2013-14 products. He has more than 20 of them. Most are premium cards with different combinations of autographs, low numbering and memorabilia. However, for those on more limited budgets, there are a handful of cheap rookie cards as well. For those wanting to dig deeper and go beyond basic Filip Forsberg rookie cards, he has cards dating as far back as 2011-12. He's in 2011-12 Swedish Allsvenskan, an international issue that's not overly expensive but can be tricky to find in North America. Although the final cards weren't released until after several of his rookies were out, Forsberg was one of the rookie redemptions from 2012-13 Upper Deck Artifacts Hockey. He has both a regular cards, numbered to 699, and an autograph. Panini also paired Forsberg with Seth Jones for a 2012-13 Panini Limited Hockey Rookie Redemption that's numbered to 499. The following checklist breaks down all the Filip Forsberg rookie cards found in base sets. It does not have inserts or parallels. 2013-14 Filip Forsberg ICE Rookie RC #119 86 99 Nashville Predators Superstar!! !